New Rochelle, NY, April 15, 2019–A new study has shown that allowing “dark play” in a serious video game intended to practice skills transferable to a real-life setting does not impact the game’s effectiveness. Dark play, in which players choose inappropriate or unethical actions, is an option in nearly all video games. The study, which evaluated the ability and attitudes of medical students in caring for delirious patients, is published in Games for Health Journal, a peer-reviewed publication from Mary Ann Liebert, Inc., publishers. 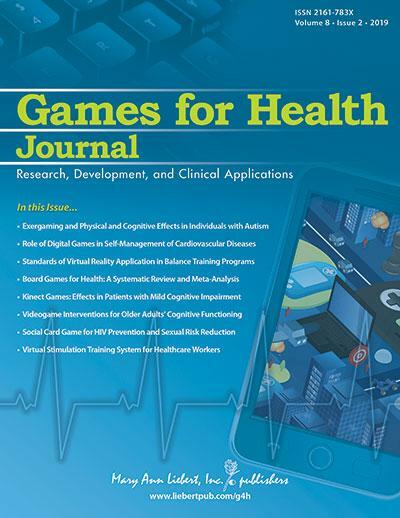 Click here to read the full-text article free on the Games for Health Journal website through May 15, 2019. “Dark play is not ordinarily investigated in Games for Health Journal, yet it may provide a mechanism for enhancing effectiveness. Buijs-Spanjers and her team tested dark play in the context of a medical education game. Their findings should be of interest to diverse game designers,” says Tom Baranowski, PhD, Editor-in-Chief of Games for Health Journal, from USDA/ARS Children’s Nutrition Research Center, and Department of Pediatrics, Baylor College of Medicine, Houston, TX. Games for Health Journal breaks new ground as the first journal to address this emerging and increasingly important area of health care. The Journal provides a bimonthly forum in print and online for academic and clinical researchers, game designers and developers, health care providers, insurers, and information technology leaders. Articles explore the use of game technology in a variety of clinical applications. These include disease prevention and monitoring, nutrition, weight management, and medication adherence. Gaming can play an important role in the care of patients with diabetes, post-traumatic stress disorder, Alzheimer’s disease, and cognitive, mental, emotional, and behavioral health disorders. Mary Ann Liebert, Inc., publishers is a privately held, fully integrated media company known for establishing authoritative peer-reviewed journals in many promising areas of science and biomedical research, including Cyberpsychology, Behavior, and Social Networking and Telemedicine and e-Health. Its biotechnology trade magazine, GEN (Genetic Engineering & Biotechnology News), was the first in its field and is today the industry’s most widely read publication worldwide. A complete list of the firm’s 80 journals, books, and newsmagazines is available online at the Mary Ann Liebert, Inc., publishers website.